Exhibitors have the opportunity to meet face to face with some 3,400 conference attendees representing all facets of EMS, including medical directors, administrators, paramedics, nurses, firefighters, and EMTs from all over Texas as well as a handful of other states. 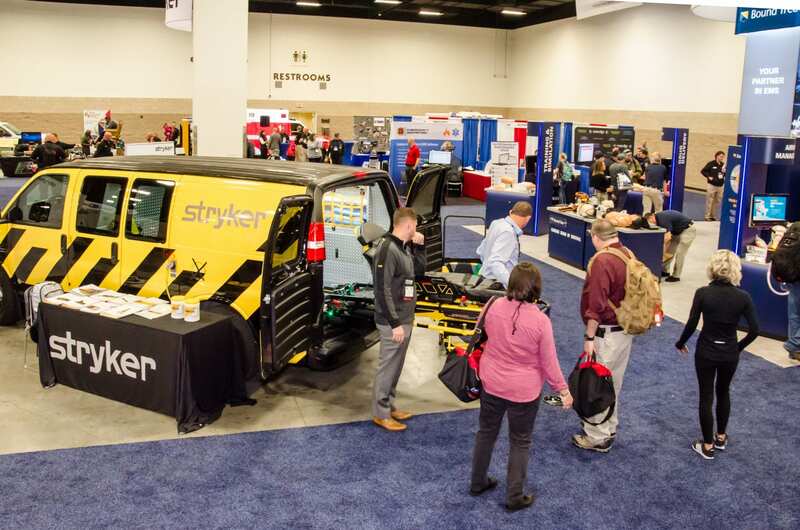 The Fort Worth Convention Center offers the perfect venue to display a variety of products, services, equipment, and vehicles serving EMS providers. Many EMS providers also find this the perfect place to recruit some of the best EMTs and paramedics in the State. We hope to see you in Fort Worth. Register early for the best spaces. Exhibitor registration for Texas EMS Conference 2019 will be online only. Registration fees may be paid by credit card, check, or purchase order. By registering, you accept our Terms and Conditions and Rules and Regulations for exhibitors. Exhibitors have multiple booth options to choose from, including the standard 10′ x 10′ booth space, premium 10′ x 10′ booth space, 20′ x 20′ island space, 20′ x 30′ vehicle spaces, 20′ x 50′ helicopter spaces and conference sponsorship. Early-bird pricing is available until August 31, 2019. Regular rates will apply after this date. To see available booth spaces please view the 2019 Exhibit Show floor plan. Booths assignments are made as registration and payment are received. Refunds may be requested, subject to a 20% administrative fee, through October 1, 2019. Refunds will NOT be given for any reason after October 1, 2019. A number of sponsorships are available to Texas EMS Conference exhibitors. Take advantage of special sponsorship opportunities to reach more than 3,000 attendees. Sponsorships range from $3,950 to $21,000 including discounted booth spaces. There are special sponsorships available for the Welcome Reception, conference breaks, conference bags, etc. that can be added using the online exhibitor registration form. We can tailor a sponsorship to fit your company’s goals. Let us build a sponsorship that works for you. For information on sponsorships, please call 512-759-1720 or email Billy Sladek at bsladek@texasemsconference.com. All vehicles must move in on Saturday. Helicopters have priority and will be scheduled for morning move-in. All exhibitor representatives must vacate Exhibit Hall by 6:00 pm. All exhibitor materials must be cleared of aisles by 10:00 am. Exhibit space must be occupied by 11:00 am. Helicopters have priority; loading yard will be cleared for helicopter move-out.